Tapado, a delicious seafood soup with coconut milk, is a traditional dish from the Caribbean coast of Guatemala and Honduras. 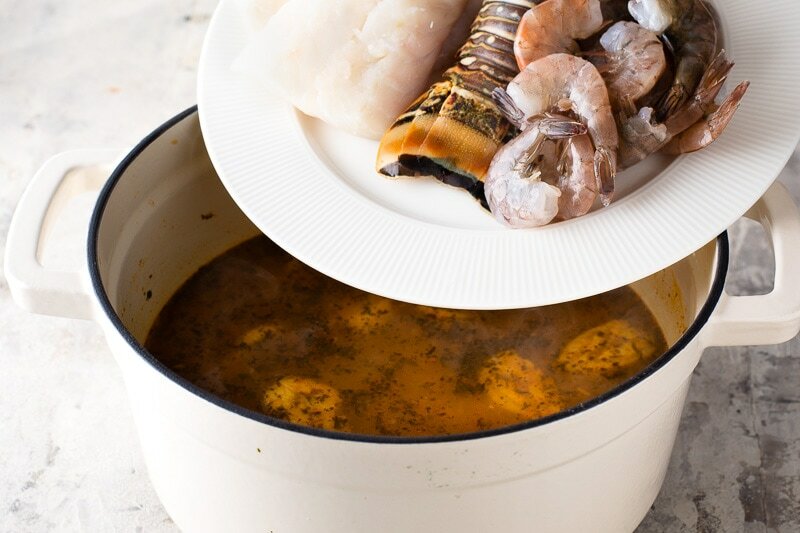 The fragrant coconut broth, packed with fresh fish, lobster, shrimp, plantain and yucca, makes it ideal for lunch or dinner. It’s winter and I’m craving a bowl of Guatemalan tapado soup. A taste of the tropics is just what’s needed to brighten up a gloomy winter day. 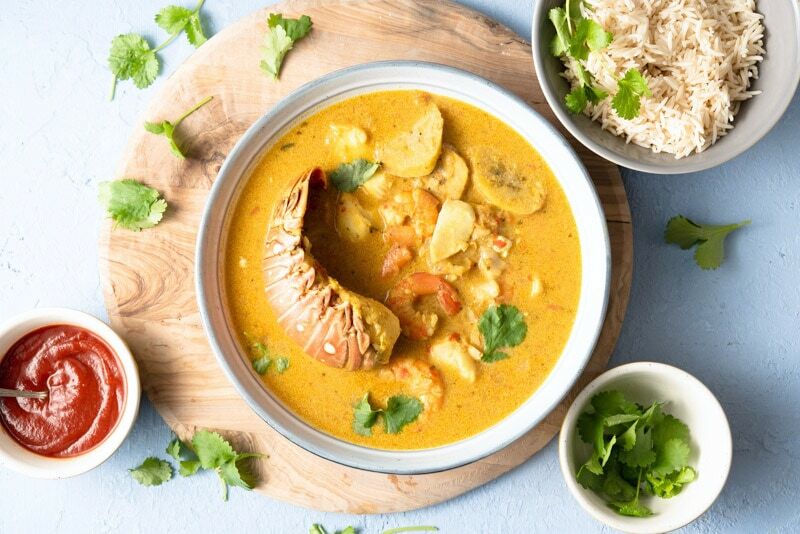 And nothing quite says the tropics like the sunny Caribbean flavours of tapado soup, a seafood soup with coconut milk, seafood, plantain, yucca and fresh spices. 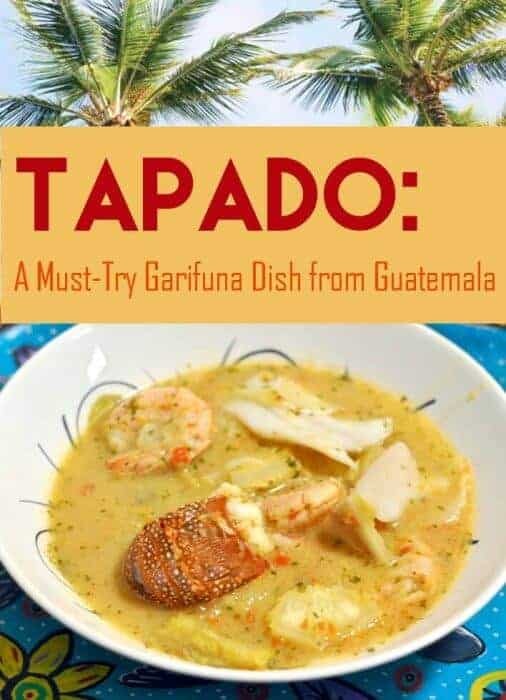 While you may not heard of tapado, it’s one of the most popular traditional Guatemalan foods from the country’s Caribbean coast and is a flavourful concoction of seafood, plantain, yucca, coconut milk and spices. It’s also very easy to make. This Guatemalan recipe for tapado soup is sure to become one of your favourite dishes for everyday or entertaining. Unlike the hearty stews of the highlands of Guatemala such as kak-ik, pulique and pepian, tapado seafood soup hails from Puerto Barrios and Livingston on Guatemala’s Caribbean coast. 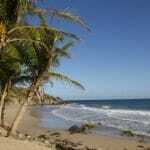 It’s also popular in Tela, Roatan and other beach destinations in Honduras. 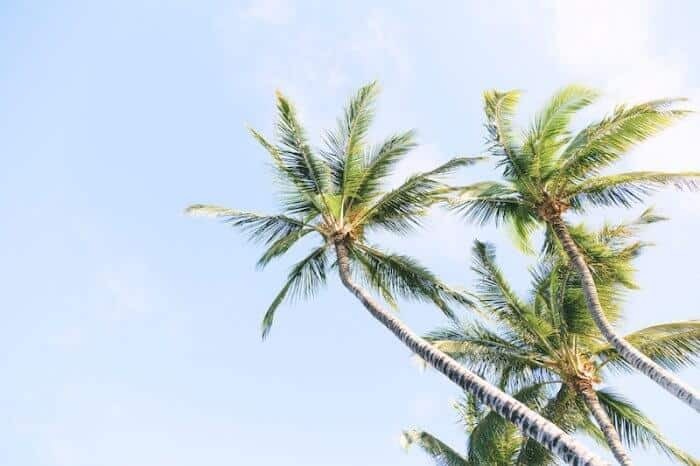 This stretch of the Caribbean coastline from Belize to Honduras is also known as the “banana coast” due to the vast quantities of bananas produced in the region. The United Fruit Company, an American corporation founded in 1899, that had a monopoly on international banana trade and once controlled the territories and transportation networks along the coast of Central America as well as parts of the Caribbean and South America. The coast of Guatemala, Belize and Honduras continues to be home to the Garifuna people, a distinct cultural group originally from Africa. The music, religion and culinary traditions of the Garifuna people are quite different from those of the Maya from the highlands. You’re more likely to see fish, shrimp, coconut, plantain, banana and hot pepper sauces in the typical dishes in this region. Tapado is a dish that combines all of those ingredients in perfect harmony. What does “tapado” mean in English? When it comes to this dish, it means “topped” with a fried whole fish as the bowl of soup is often served with a fried whole fish laid across the top of the bowl. It’s an especially popular dish during Garifuna Settlement Day, one of the largest, most exuberant festivals in Guatemala. Travel Tip: If you’re visiting Guatemala, you don’t have to go all the way to Livingston for authentic tapado. If you’re headed to Coban, Esquipulas or Tikal, you can sample it at Marea Roja Restaurante located on the Atlantic Highway just before El Rancho. Other popular Guatemalan dishes in Livingston, Rio Dulce and Puerto Barrios include pan de coco, a coconut bread sold from baskets by women in the markets and pescado guisado con coco, whole fish steamed in coconut milk with vegetables, and Guatemalan ceviche, a seafood cocktail featuring a mix of shrimp, conch or fish. To make one of these popular traditional Guatemalan dishes from the Caribbean coast, check out our recipe for authentic Guatemalan shrimp ceviche. 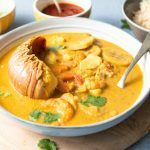 Or, for another recipe featuring coconut milk and seafood, try our easy recipe for Tahitian Poisson Cru from French Polynesia. The most important ingredient for tapado is the seafood you use. For the fish, use a firm white fish, such as halibut, haddock or cod for this recipe. Stay away from sole ( too delicate) or tuna (too oily). Try to find wild shrimp that isn’t farmed. 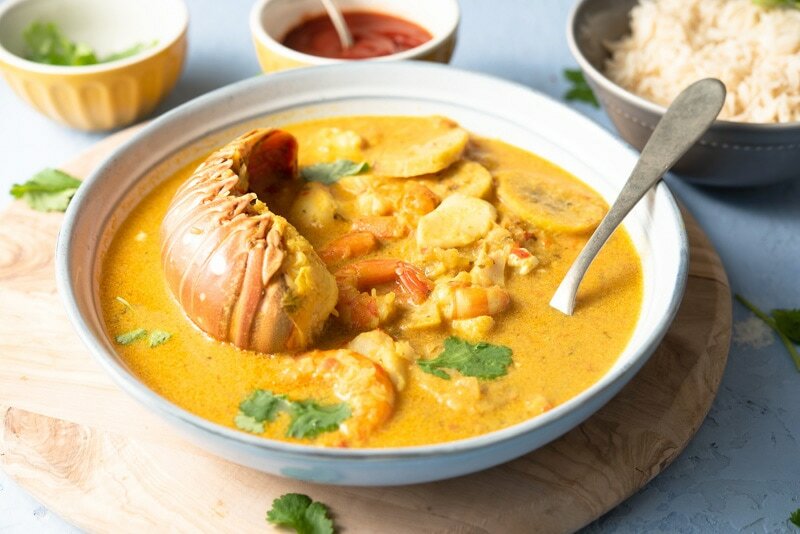 Spiny lobster is optional but elevates the soup and makes it ideal for a special occasion such as Father’s Day or Valentine’s Day. Another of the key ingredients for tapado soup is achiote, a spice and food colorant made from crushed annato seeds. It adds an slightly earthy taste and the all-important red colour to the soup. It can be purchased at virtually every Latin food shop and is quite inexpensive so is well worth adding to your pantry. If you don’t have any Latin food shops in your neighbourhood, you can also purchase it on Amazon in a paste or powder form such as the popular El Yucateco Achiote Red Paste, 3.5 oz. For coconut milk and hot sauce, I usually look for products from Grace Foods. 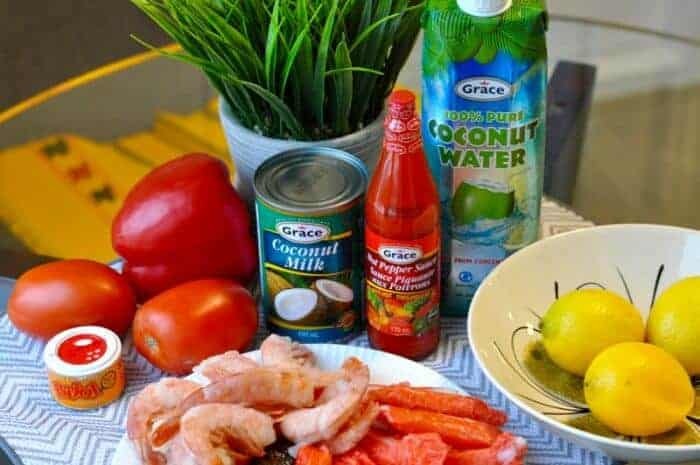 Founded in 1922 and now the Caribbean’s leading food manufacturer and distributor, Grace Foods produces their famous 100% pure coconut water, jerk sauces, coconut oil and hot pepper sauces as well as exciting new products such as coconut vinegar, a wellness product that’s packed with so many health benefits its vying with apple cider vinegar in popularity. Most importantly for our family, none of Grace Food Product line contains the Monosodium Glutamate (MSG) additive, so you don’t have to worry about having an adverse reaction if you have a sensitivity to MSG. 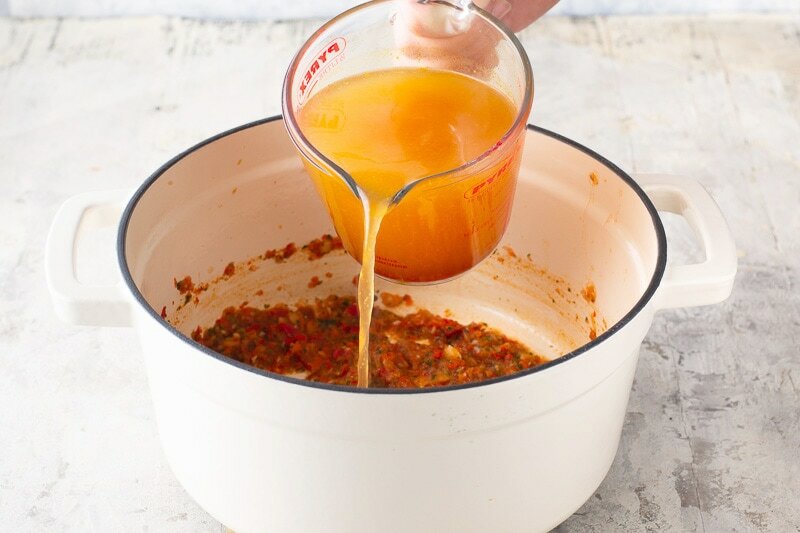 Begin by making a sofrito, a typical base for many Guatemalan and Latin American soups, stews and dishes. While in countries such as Spain, Portugal or the Caribbean a sofrito, refogado or sofregito might include peppers, garlic and spices, in Guatemala a basic sofrito always includes tomato, onion and cilantro. 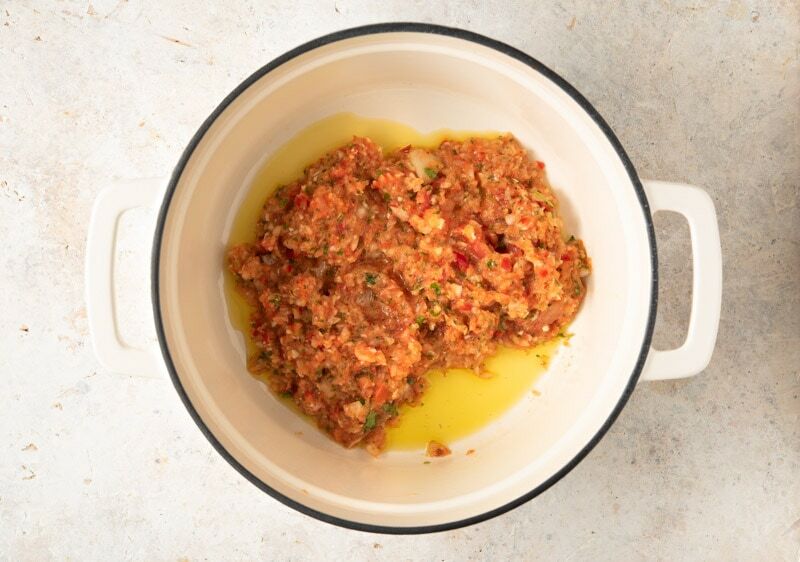 To make a sofrito for this tapado recipe, chop the peeled tomatoes, red peppers, jalapeno, cilantro and onions into small pieces and sauté the mixture in vegetable oil until soft, but not browned. It should be saucy and not dried out. Add the achiote to warm fish broth or water and stir until completely dissolved. Next, pour the seafood stock (or water if you’re using) with the dissolved achiote into the sofrito in your soup pot. Bring the broth to a low boil, add the sliced plantain, green banana and yucca to the broth, add the coconut milk and simmer the vegetables for 10 minutes until almost done. When adding the coconut milk be sure to stir the contents within the can of coconut milk first so you mix the rich coconut cream from the bottom of the can with the thinner coconut milk at the top. 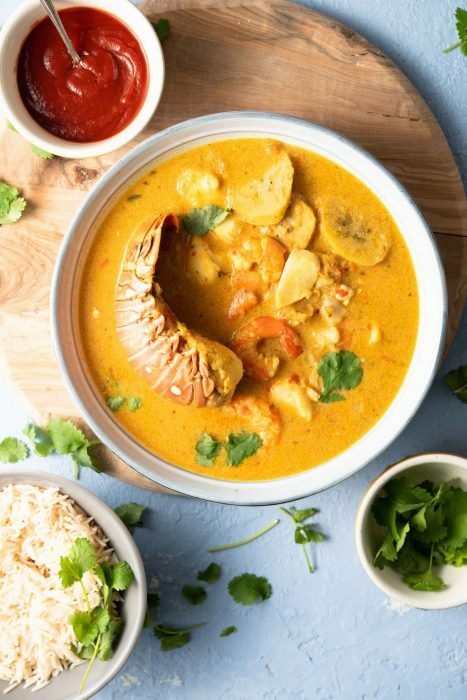 Next, add your mix of seafood (lobster, fish, tiny crab or shrimp) into the broth with the partially-cooked plantain and yucca being sure to submerge the seafood into the broth. Add more water, if necessary, to cover the seafood. Simmer for 10 minutes until the seafood is fully cooked. Garnish with chopped cilantro and serve with white rice and hot sauce on the side. In Guatemala, tapado is often served with a crispy, whole fried fish on top. This is also an option if you’d like to go with the traditional Garifuna version. When choosing a plantain to use for tapado, look for one with black skin indicating it’s ripe but try to select one that isn’t mushy. Green bananas add a taste of bitterness that is a nice complement to the sweetness of the coconut milk. Green bananas are simply unripe versions of the yellow banana. They’re often used in savoury dishes in the Caribbean. Don’t overcook your tapado soup. You want the fish and seafood to stay intact. Use a firm white fish, such as halibut, haddock or cod for this recipe. Stay away from sole ( too delicate) or tuna (too oily). Saute the chopped vegetables in oil until soft and saucy but not browned. Add seafood and simmer for another 5-10 minutes until vegetables and seafood is tender but not mushy. Green bananas add a taste of bitterness that is a nice complement to the sweetness of the coconut milk. Green bananas are simply unripe versions of the yellow banana. They're often used in savoury dishes in the Caribbean. 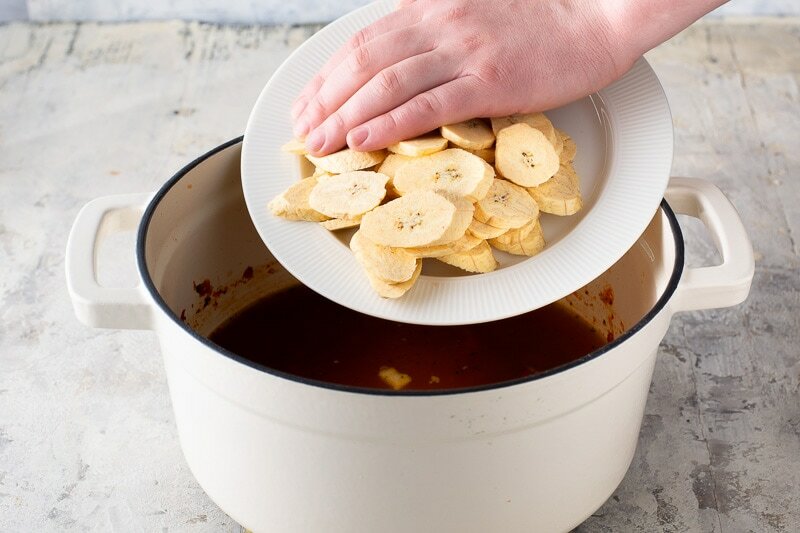 Don't overcook your tapado soup. You want the fish and seafood to stay intact. Use a firm white fish, such as halibut, haddock or cod for this recipe. Stay away from sole ( too delicate) or tuna ( too oily). In Livingston, tapado is often served with a fried whole fish on top. To serve it the traditional Garifuna way, be sure to gut and scale the fish, dry it thoroughly, sprinkle it with sea salt and fry it in corn oil until very crispy. Check out our other easy Guatemalan recipes or traditional recetas guatemaltecas below. Disclosure: A Taste for Travel participates in affiliate advertising programs. Read more on our Disclosure Page. That tapado recipe looks absolutely delicious! adding to my must try recipes. 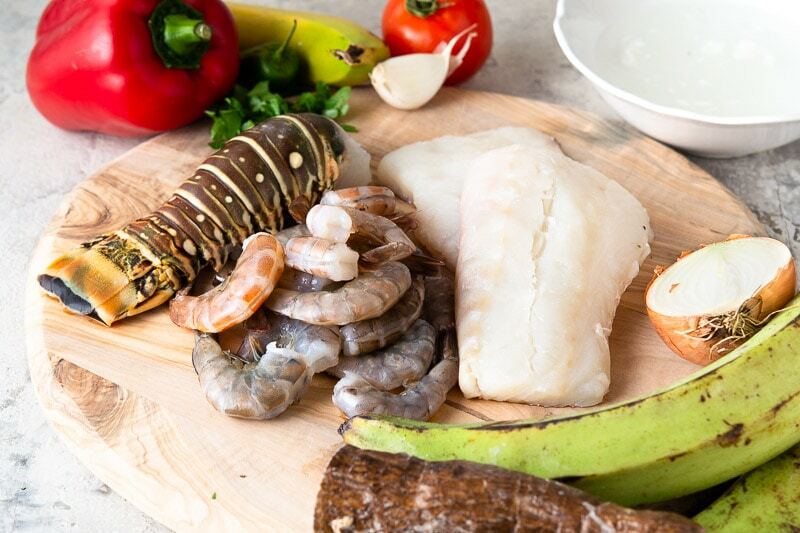 I’m craving Caribbean flavours, too, especially seafood. I’d like to try the Grace coconut milk or coconut oil! 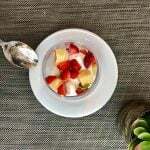 The coconut milk sounds really versatile and could be used in many dishes. 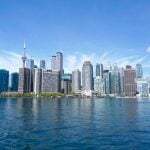 I follow @tastefortravel as @loucheryl . Auto correct put @l and I hit enter by mistake and now I can’t correct it. Sorry. Thanks for following Cheryl and best of luck on the giveaway! I can’t wait to try the coconut milk in my next fish dish!